We've long known Democrats are only compassionate and outraged when it suits them politically, but this is a new low! 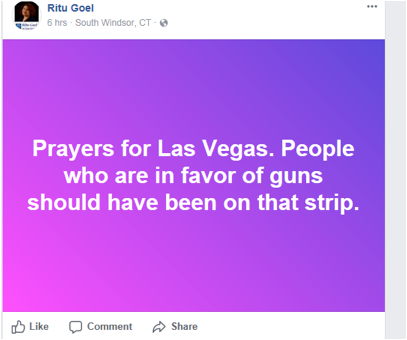 Recently in a social media post, Ritu Goel wished gun owners were victims of the Las Vegas massacre that left 59 dead. statements blaming Republicans and the NRA for her hateful remarks. Americans MURDERED! THIS IS WRONG! South Windsor Democratic Town Committee?